To the average American citizen few regions of the world are more veiled in myth and misconception than the Middle East. This region is conceptually a fairly modern and Euro-centric area which spans a vast territory from Northern Africa all the way to Eastern Iran. The concept of what is now considered the Middle East may be traced back to the area that Arabian Muslims invaded after the Prophet Muhammad's death in 632 A.C.E (Husain). Despite a heavy association with Islam the region known as the Middle East has diverse array of culture heritage and diversity that spans outside of Islam, which has helped define the region. The diversity and history of each unique region in the Middle east are reflected in their cuisine. For instance, breads in Egypt are extremely important, the importance of leavened bread is even directly referenced in the Old Testament. Across the Red Sea the diet of Saudi Arabia relies heavily on rice instead of bread, as well as the heavy use of chicken and lamb. The food ways of these areas may share some overlapping dishes, but they also intertwine with each geographical areas history. Mesopotamia, the cradle of civilization, was found in between the Tigris and Euphrates river in modern-day Iraq. This is where scholars have been able to trace back the earliest signs of civilization in the Western world. The growth of civilization in Mesopotamia was due to the the fertile land and adoption of agriculture. Agriculture allowed for a larger production of food, which could support a larger population than the simple hunter and gatherers of their ancestors, who were more focused on finding their next meal than building upon a lexicon of unique culinary traditions. Because of this diversity of culture, spices, and produce all found the Middle East, unique areas all throughout the region developed some incredible culinary traditions, which I hoped to honor in this dish, a humble yet delicious fusion. 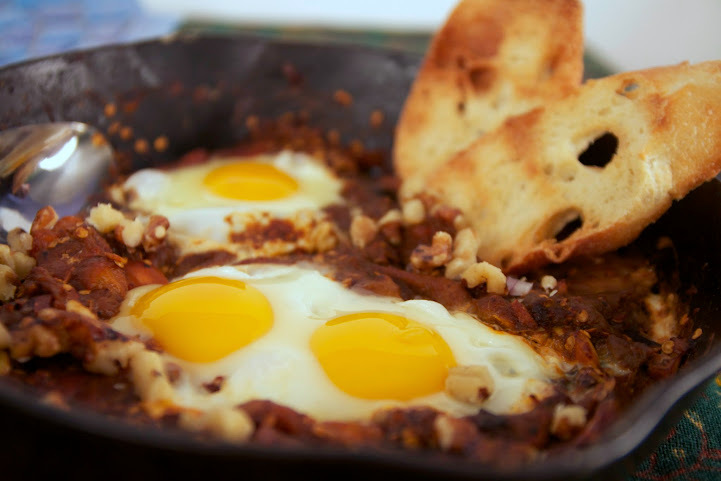 I wanted to fuse a North Iranian breakfast dish known as Mirza Ghaseni, which is an egg and eggplant mixture with Shakshuka, a North African (Clark) egg and tomato sauce stew. This skillet can either be served as an appetizer or an entree, and the exclusion of the eggs makes the meal completely vegan, if dietary restrictions demand. Slice eggplant in half length-wise, and lightly coat the exposed flesh in oil. Place the eggplant on a sheet pan skin-side up. with a sharp knife poke several holes in the skin of the eggplant. Roast for 40 minutes. While eggplant is roasted cook minced garlic in a skillet for 2 minutes on medium heat, add tomato paste, tumeric, and smoked paprika and cook for another 2 minutes. Add freshly diced tomatoes to the skillet and cook for another 10-15 minutes. When eggplant is done cook scrape the flesh from the skin and add to the skillet mixture. Salt skillet mixture to taste. Turn the heat to medium low and make several holes in the skillet mixture so that the skillet surface shows. Crack several eggs into the holes made, so they come in direct contact with the metal surface. Cook the whites of the eggs through, then garnish with crushed walnuts. Clark, Melissa. " Shakshuka With Feta ." Cooking. New York Times, n.d. Web. 15 Feb. 2015. <http://cooking.nytimes.com/recipes/1014721-shakshuka-with-feta>. Husain, Salma. Islamic Food: with Healing Toucch. New Dehli: Roli Books, 2011. Print.